I am often reminded of the beautiful power of #breath. Such a simple act, breathing… often (usually?) done without thought or attempt at control… yet, of all the things we try to control in this world, our breath is such an accessible one. From the long inhale that accompanies a good morning stretch to the huffed exhale of exasperation to the soft sigh of relaxation at the end of a stressful day. There is so much our breath can do for us, reveal about us, and heal within us… if we only take the time to truly breathe. This thought has really stuck with me this week, especially in times of stress. I’ve been stressed a lot lately… mostly to do with parenting and the transition that comes with the end of another school year, but other things to do with finances, home improvement, and smog checks, as well. It is a welcome reminder… the power I hold in the muscles of diaphragm and rib cage, how they can quickly calm my nervous system and return awareness to what is happening in my body in this moment now. This is where my true appreciation of yoga and meditation is rooted. So much of managing my stress and anxiety, of recognizing my trauma triggers and learning to act mindfully (rather than react blindly), comes down to noticing what is happening in my body. 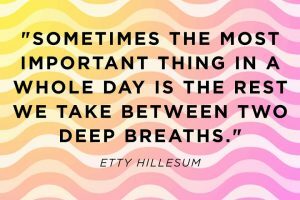 Through consistent practice, I’m getting better at using my tools of breath, TRE®, and purposeful movement to truly care for me in these moments of mini-crisis. And, truthfully, nothing feels as healing and empowering as knowing how to tune in to my soul, truly listen, and give myself the care I need.